December 27, 2012 by andrea | Filed under Christmas, Holidays, Quick Cooking, Recipes, Sandwich, Thanksgiving, Turkey. This recipe is a great way to use up leftover roast turkey. Or just use deli turkey if you prefer. 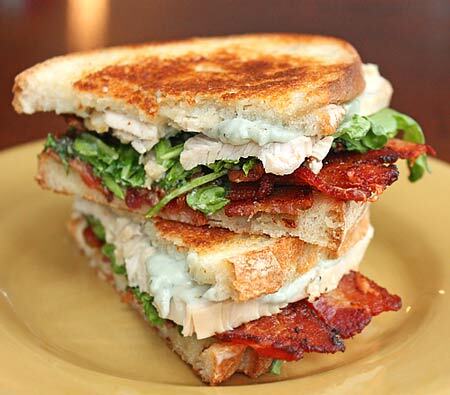 I love the combo of smoky bacon and blue cheese…yum! Radicchio is a sturdy leafy green veggie that holds up well to heat. I didn’t have any (and wasn’t going to make another trip to the store) so I substituted arugula. The arugula wasn’t the best substitution (it wilted) but sometimes you just make due with what you have. Enjoy! This is the ultimate turkey sandwich. Makes 2 servings. Cook bacon in large skillet over medium heat until crisp. Transfer to paper towels. Pour off fat from skillet; reserve skillet. Mash mayonnaise and blue cheese in bowl to coarse puree; season with pepper. Place bread on work surface. Divide cheese mixture among bread slices, spreading evenly. Divide bacon, radicchio, and turkey between 2 bread slices. Top with remaining bread, cheese side down. Melt 2 teaspoons butter in reserved skillet over medium heat. Place sandwiches in skillet. Spread 2 teaspoons butter on top pieces of bread. Cover with lid that is slightly smaller than skillet. Cook sandwiches until lightly browned, about 4 minutes per side.